Should you tuck or untuck your shirt? Shirt tucking offers a more refined, polished look. A style war has long divided those at the office and even good friends. One simple difference of opinion. Is it tucked? Or untucked? No, I'm not talking about cosmetic surgery and the doing away of beer-belly fat. I'm referring to the rules governing when – and where – one should tuck in a button-down shirt, as opposed to leaving it out. Whether for or against the tradition of shirt-tucking, the evolution of men's style proves it has good reason to stick around. So, get ready to tuck it (when you have to) and learn to master those occasions when it's OK to let it all hang out. Shirt tucking offers a more refined, polished look to even the most simple of outfits. And it's very much occasion-appropriate: tucked for corporate and formal settings and untucked for casual wear and, dress-code permitting, smart casual events. Then, there's the shirt structure. Shirts that are made with a flat 'bottom' hem are designed to be untucked (but have the option of tucking if the occasion asks for it). But if the shirt has visible shirttails (think the rise and fall of the hem, which is longer at the front and back of the shirt) then the design implies that the shirt must be tucked-in. Despite this, there are sometimes exceptions to rule. Let's help you out. Except for a random few hipster creatives who'll try anything to start a workplace trend, the shirttails of button-downs have always been (and should be) tucked into your pants. Ignore this rule, and expect to look clumsy and messy in the office; simultaneously destroying all the hard work you put into buying the perfect business suit. Trouser separates (without a jacket) and business shirting should follow the same rule. Even those sweater-wearers, who insist on letting the tails hang out below their knit, have to be retold: it's a contrived way of looking fashionably dishevelled. And instead, feels more like a stunt a school boy might pull-out, to feel more like a rebel. Collared shirting with 'tailored' jeans or chinos is another tucked-in option. But this time, it's not essential. If your button-down shirt falls more than 3 inches past your belt, tuck it. And, the nature of the jeans (serving as a smart casual bottom) means the shirt looks great tucked; giving off a European feel instead of looking like a Seinfield character. 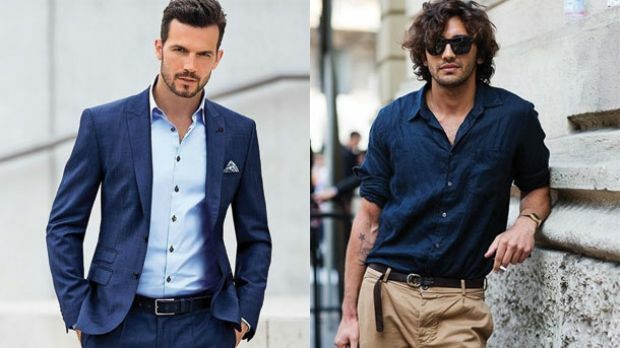 The untucked shirt is meant to be a summery vibe so experiment with prints and colours, and opt for lightweight shirt fabrics, such as cotton, seersucker and linen. Chucking a blazer over the shirt refines the look, as well as adding a belt, leaving the bottom button of the shirt undone to expose the buckle. Make sure you leave the collar unbuttoned at all times to avoid looking like a hipster. However, too much 'heavage' is equally unattractive, so go easy on how many buttons you open. The longline trend is big right now, and while its definitely not for the average bloke, being aware of it can help you incorporate some different shirt pieces into your weekend wardrobe. 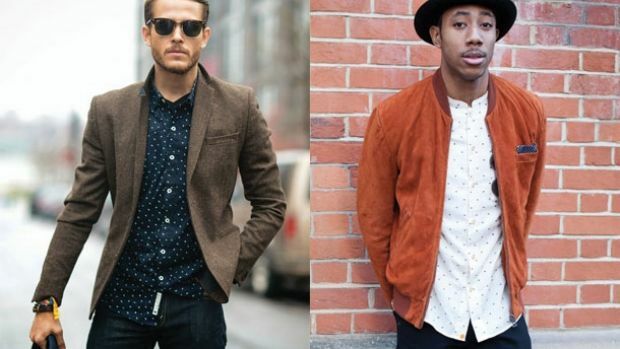 Keep this style of shirt slim in the shoulders, arms and torso, so it falls streamline. Opt for monochrome palettes only, adding to the minimalism of this trend. Pair over skinny or slim jeans, and cropped ankle trousers in a straight fit. Not confident to pull it off? Skip it. 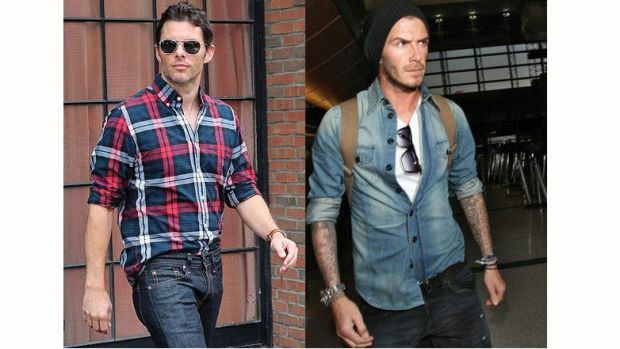 Championed by the likes of David Beckham and James Marsden, the half-tuck is a casual solution to the shirt-tuck dilemma that is simple and subtle. The basics of the Beckham half-tuck involve the shirt (often layered over tee) worn deeply unbuttoned; one side of its hem nonchalantly tucked behind a belt – almost as if by accident. The look is derived from the concept of the over-shirt being some sort of 'jacket' to the common tee, and works well with casual layering. It's perfect for vintage wash jeans to show-off their front scars; letting the half-tuck avoid any sort of tucked-in refinement, which doesn't really suit Beckham's beanie biker look. Marsden takes an even more subtle approach to the half-tuck – only slipping in the front of his shirt, letting the back hang out. This look is more precarious than Beckham's as it can look to 'planned' and borders on trying too-hard if done wrong. Make sure the shirt isn't too long (more than three-inches past belt) and keep this look to macro printed shirts: those with a check or tartan print that may look too 'cowboy if completely tucked into jeans. Unlike Beckham's half-tuck, the Marsden should only be tried with denim, as a flapping shirt back over chinos just looks plain sloppy. Rollneck shirts look best tucked when worn under a blazer for a European look. Alone and on their own, leave them untucked to avoid looking to like a '90s Scandinavian. Polo shirts have a flat bottom hem, meaning the can be worn untucked. If you're after a preppy look, tuck it in. Now you're ready to hit the golf course. Retro print shirts are often the loudest of the prints with large florals and animal illustrations running wild over the shirt. To avoid looking like a oh-so-happy primary school teacher, don't tuck them in. Period. T-shirts are the most widely debated globally. If you're European, you'll vote 'yes' to the tuck, worn with a leather belt and metallic buckle on the waist of summer shorts or chinos. Historically, Americans like the tucked look too; going for a Steve McQueen or James Dean aesthetic with a tucked-in tee – no belt – and denim jeans. Australians aren't so sure. One thing's for certain; the tuck-in is one big fashion statement. So, do it confidently.